South Korea’s Little League team returned to Seoul and a hero’s welcome this week, having become the third team from their country to win the Little League World Series while running its perfect record in Williamsport to 11-0. Some of those Little Leaguers may grow up to be one of the favorite athletes in Korea, or maybe all of Asia. They might ply their trade in their homeland or overseas. 1. 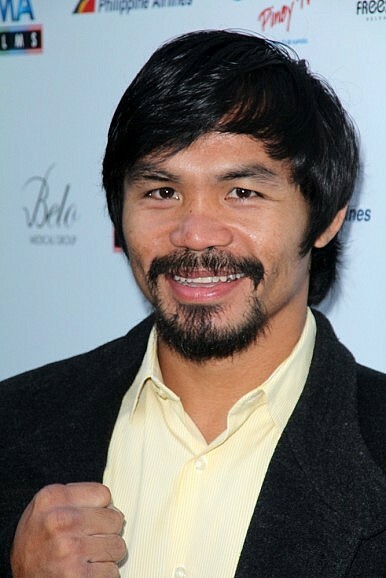 Manny Pacquiao (boxing, Philippines; No. 1 in 2013) – After convincing victories over Americans Brandon Rios and Timothy Bradley over the last year, the Filipino great has regained his preeminent status as a boxer and global icon. However, at age 35, his window of dominance is certainly closing while a much-hyped potential bout against Floyd Mayweather does not appear to be in the cards. Instead, Pacquiao will fight another American, Chris Algieri this November in Macau. 2. Masahiro Tanaka (baseball, Japan) – Tanaka had the rapt attention of two countries as he made a splashing debut in Major League Baseball in April after becoming the most expensive import from Japan. For three months, he was utterly dominant, running his record to 12-4 with a 2.51 ERA for the New York Yankees. But a torn elbow ligament has sidelined him since early July and his return this season remains uncertain as he may need Tommy John surgery to repair his injury. 3. Li Na (tennis, China; No. 4 in 2013) – Li became the most decorated Asian tennis player earlier this year when she won the Australian Open, her second Grand Slam title, and rose to No. 2 in the world. But injuries have derailed her season since, as she’s made early exits at the French Open and Wimbledon and is sitting out the ongoing US Open because of a knee injury. 4. Viktor Ahn (speed skating, Russia) – Formerly known as Ahn Hyun-soo, he became the most decorated short-track speed skater in history when he won three golds and a bronze for Russia in the Sochi Winter Games – matching his previous haul in Turin 2006 while skating for his native South Korea. Ahn was unceremoniously dumped by the Korean Skating Union and left off the 2010 team before he defected to Russia. 5. Jeremy Lin (basketball, Taiwan; No. 2 in 2013) – Again the only non-Asian born athlete to make the list, Lin remains wildly popular in his parents’ native Taiwan and his ancestral homeland of China. Lin’s had two mediocre seasons in Houston where he was shunned by the coaching staff. An offseason trade to the Los Angeles Lakers may be just what he needed to reinvigorate his career and reignite the “Linsanity” that made him a household name throughout Asia. 6. Kei Nishikori (tennis, Japan) – The meteoric rise of the 24-year-old has stoked interest in tennis in Japan as never before – attendance in major tournaments there has increased by 44 percent over the last two years. Now coached by former Grand Slam winner Michael Chang, the fleet-footed Nishikori became the first Asian-born man to crack the top 10 in the world rankings earlier this year and is seeded 10th at the ongoing U.S. Open. 7. Hyun-jin Ryu (baseball, South Korea) – The 27-year-old left-hander has emerged as a mainstay of the Los Angeles Dodgers’ pitching rotation, which also features former Cy Young winners Clayton Kershaw and Zack Greinke. Ryu is a solid 13-6 with a 3.28 ERA in his second season in MLB before a muscle strain sidelined him two weeks ago. He’s expected to return soon and help carry L.A. to its first World Series title since 1988. 8. Kumar Sangakkara (cricket, Sri Lanka) – With the retirement of India’s Sachin Tendulkar last year, the Sri Lankan great has taken over the mantle as the top batsman in cricket. The left-hander is currently No. 1 in the ICC Test batting rankings after leading Sri Lanka to its first ICC World Twenty20 championship in April, defeating India by 6 wickets in the final. He’s also famous for his clever sledging during matches (cricket’s version of trash-talking). 9. Shinji Okazaki (soccer, Japan) – Though Asian teams had a disastrous World Cup in Brazil, including Japan, Okazaki nevertheless shone for the Samurai Blue. The 28-year-old striker scored one of Japan’s two goals in the tournament, and is coming off a season with Mainz in which he set a record for most goals scored by a Japanese player in the Bundesliga, with 15. He’s off to a great start this season, with three goals in four matches already. 10. Inbee Park (golf, South Korea) – After a brief slump over the last 12 months, Park has resumed her quest to dominate women’s golf, winning her fifth Grand Slam title at the LPGA Championship two weeks ago. Park won six times on the LPGA Tour last year, including the year’s first three majors. Her return to form has pushed her back to No. 2 in the world rankings as she enters the prime of her career after turning 26 in July. Top Ten Asia-Pacific Sports Events of 2013Asia’s Big Year in TennisAmir Khan: Boxing’s Saving Grace in Pakistan?Competition for the 2022 Winter Olympics Heats UpPacquiao vs. Mayweather. Will It Finally Happen?